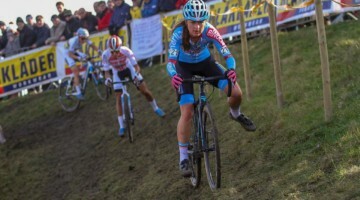 Superprestige Diegem, an afternoon/night race, hosts most of the world’s best racers today, including the Euro Cross Camp attendees. In the U23 men’s race, Quinten Hermans continued his strong season with a close win over Joris Nieuwenhuis, with U23 World Champ Eli Iserbyt in third. 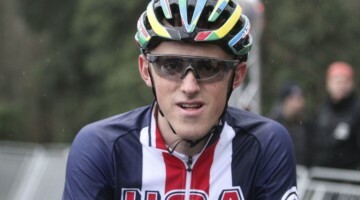 Five Americans took the start, led by Pan American Continental Champ Curtis White in 10th. First-year U23 Gage Hecht in 19th, Cooper Willsey in 28th, Eric Brunner in 40th and Maxx Chance finished in 45th. Canadian Trevor O’Donnell finished 46th. 1 2 HERMANS Quinten BEL 22 Telenet-Fidea CYCLING TEAM 0h52'45.0 "
2 5 NIEUWENHUIS Joris NED 21 RABOBANK DEVELOPMENT TEAM 0h52'47.0 "+2.0"
3 1 Iserbyt Eli BEL 20 MARLUX - NAPOLEON GAMES Cyclin 0h52'48.0 "+3.0"
4 6 CLEPPE Nicolas BEL 22 Telenet-Fidea CYCLING TEAM 0h52'57.0 "+12.0"
5 4 AERTS Thijs BEL 21 Telenet-Fidea CYCLING TEAM 0h53'10.0 "+25.0"
6 57 ORTS LLORET Felipe ESP 22 Ginestar-DELIKIA-RIDLEY 0h53'13.0 "+28.0"
7 11 JOSEPH Thomas BEL 21 MARLUX - NAPOLEON GAMES Cyclin 0h53'28.0 "+43.0"
8 7 WOUTERS Sieben NED 21 RABOBANK DEVELOPMENT TEAM 0h53'35.0 "+50.0"
9 10 VAN DER HEIJDEN Maik NED 20 RABOBANK DEVELOPMENT TEAM 0h53'48.0 "+ 1'03.0"
10 51 WHITE Curtis USA 22 OPTUM P / B KELLY BENEFIT STRATEGIER 0h53'55.0 "+ 1'10.0"
11 43 VAN DER MEER Gosse NED 22 Colba - Superano HAM 0h54'13.0 "+ 1'28.0"
12 8 Yannick Peeters BEL 21 Crelan-PROPERTY SERVICE CONTINE 0h54'25.0 "+ 1'40.0"
13 63 Dubau Joshua FRA 21 TEAM PELTRAX - CSD 0h54'26.0 "+ 1'41.0"
14 35 BAKX Kelvin NED 21 Willebrord TO FORWARD 0h54'37.0 "+ 1'52.0"
15 14 SCHUERMANS Jelle BEL 21 Crelan-PROPERTY SERVICE CONTINE 0h54'47.0 "+ 2'02.0"
16 9 GOOSSENS Kobe BEL 21 Telenet-Fidea CYCLING TEAM 0h54'55.0 "+ 2'10.0"
17 22 DRIESEN Jarne BEL 19 LARES-DOLTCINI CT 0h55'02.0 "+ 2'17.0"
18 19 DEGROOTE Jonas BEL 22 Superano HAM - ISOREX - TARTEL 0h55'14.0 "+ 2'29.0"
19 50 HECHT Gage USA 19 HOT TUBES CYCLING TEAM 0h55'16.0 "+ 2'31.0"
20 39 CONSTRUCTION MANS Dylan NED 20 Willebrord TO FORWARD 0h55'20.0 "+ 2'35.0"
21 12 DEKKER Jens NED 19 Beobank - CORENDON 0h55'25.0 "+ 2'40.0"
22 30 VANDEBOSCH Victor BEL 19 IKO ENER-THERM Beobank 0h55'30.0 "+ 2'45.0"
23 15 ROMBOUTS Seppe BEL 19 ACROG - BALES BC 0h55'37.0 "+ 2'52.0"
24 3 ?oupalík Adam CZE 21 Beobank - CORENDON 0h55'38.0 "+ 2'53.0"
25 60 TURGIS Tanguy FRA 19 US METRO TRANSPORTS 0h55'42.0 "+ 2'57.0"
26 42 VAN DER HEIJDEN Bjorn NED 22 WV SCHIJNDEL 0h55'45.0 "+ 3'00.0"
27 13 JASPERS Jappe BEL 19 IKO ENER-THERM Beobank 0h55'48.0 "+ 3'03.0"
28 52 Willsey Cooper USA 20 USA NATIONAL TEAM 0h55'48.0 "+ 3'03.0"
29 17 CALUWE Stijn BEL 21 Beobank-CORENDON 0h55'55.0 "+ 3'10.0"
30 56 LIES SENS Jarno BEL 19 IKO ENER-THERM Beobank 0h55'57.0 "+ 3'12.0"
31 46 Johan JACOBS SUI 20 TEAM Crelan - AA DRINK 0h56'06.0 "+ 3'21.0"
32 59 Till PAUWELS BEL 19 LARES-DOLTCINI CT 0h56'14.0 "+ 3'29.0"
33 16 BAUTERS Reno BEL 19 ACROG - BALES BC 0h56'23.0 "+ 3'38.0"
34 26 KAISE Julien BEL 22 COLOR CODE - ARDEN'BEEF 0h56'27.0 "+ 3'42.0"
35 31 Koen van Dijke NED 21 TWC FAST WHEEL 0h56'30.0 "+ 3'45.0"
36 38 FLOREN Wesley NED 20 Wielervereniging NEW HOPE T 0h56'44.0 "+ 3'59.0"
37 20 DERVEAUX Niels BEL 20 GOEMAN SCOTT CYCLING 0h56'50.0 "+ 4'05.0"
38 21 DEVOS Han BEL 20 ROCK WERCHTER-FUTURE FRIENDS 0h56'56.0 "+ 4'11.0"
39 29 SMETS Gert BEL 20 KALAS CYCLING TEAM 99 0h57'28.0 "+ 4'43.0"
40 48 Eric BRUNNER USA 19 USA NATIONAL TEAM 0h57'56.0 "+ 5'11.0"
41 53 David ERIKSSON SWE 22 GÖTEBORGS CYKELKLUBB 0h58'11.0 "+ 5'26.0"
42 37 CONSTRUCTION MANS Bryan NED 19 Willebrord TO FORWARD 0h58'30.0 "+ 5'45.0"
43 54 JANSSON Henrik SWE 22 MERIDA TEAM NLITZ 0h58'46.0 "+ 6'01.0"
44 34 WUYTS Mathijs BEL 19 KALAS CYCLING TEAM 99 0h58'57.0 "+ 6'12.0"
45 49 CHANCE Maxx USA 21 EVOL RACING 1h01'29.0 "+ 8'44.0"